Despite its satisfactory sales and sporting a style which swayed away from the domestic tradition, the Mitsubishi GTO still stamps a highly notable presence in the tuning world. Being supported by many GTO fanatics to this date, Mr. Morishita attempts to build the fastest straight-line drag GTO out there. It all began 6 months ago when Morishita received a video letter from one of his acquaintance in the United States. That video included an astonishing clip of a stateside Mitsubishi 3000GT (GTO in Japan) pulling off an impressive 9 second pass on the quarter mile. That machine was just an extension of a street vehicle, with an extreme case of weight reduction performed. Morishita was further stunned to learn that the foreign machine was mostly fitted with PitRoadM components and made consistent 9 second passes. As a competitive tuner in the DSM world, Morishita's fire was lit. Determined to achieve a higher status, the 10.7 second achieving 6G72 engine fitted with forged internals with TD06L2 turbine that made 600 horses was tossed out. They decided to build another engine. The new bottom end consisted of 1mm oversized forged 92mm pistons with H beamed connecting rods which increased the displacement to 3100cc. The crank was only balanced and not modified since Morishita believed that it wasn't necessary to as long as they didn't force the motor to over rev. Next was the head assembly. Custom strengthened valve springs accompanied the intake and exhaust high lift camshafts of 272 degrees. Since the 6G72 engine produces plenty of torque without having to spin it to the higher RPMs, there's no need to rev that high. Building the engine to achieve a 8500 RPM redline can be a disastrous decision, with rocker arms flying off and spinning connecting rod bearings in no time. The absolute limit for these engines should be 8000 RPMs at the most. The correct tuning approach should be to modify the combustion chamber and the intake ports to increase midrange torque; which PitRoadM started doing. The entire assembly is regulated by an Fcon Vpro, achieving 920 horsepower at 7500 RPMs. 672 ft/lbs of torque is produced from this beast. “Now we should be able to break the 10 second barrier with ease. We can't be losing to the boys in the US all the time.” Claims Morishita. The vehicle is planned to be tested this winter. Holding the pride of the nation's number one GTO tuner, he cannot afford to lose to this game. The 6G72, an unfriendly engine to the aftermarket tuning parts industry. At PiRoadM, tons of research and development have gone into this platform, producing a mass of engine components. The payoff and the proof is the engine shown to the left, a high boost 3.1 liter 6G72. 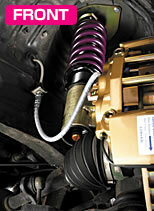 The suspension is an Aragosta base, which was modified to withstand and provide traction. 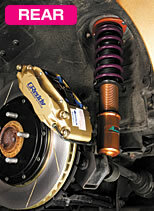 16 kg springs for front, and 8 kg for the rear was set. The rear is equipped with a custom camber arm. The suspension was set meticulously and carefully. In order to bring the large sized body to a stop, oversized brakes were installed. The front and rear was fitted with a modified Greddy brake kit. 6 pot caliper with 355mm rotors for the front, 4 pot 330mm brakes for the rear. The brake pads are a custom as well. Driver and passengers are seated in the Recaro SP-G seats. On the middle of the dashboard, Trust water temp, oil temp, oil pressure, intake temp, fuel pressure gauges are lined up. In addition, a Tomei AFR gauge with an Autometer gauge was set. The rear seats have been deleted to remove unnecessary weight however all the other trim pieces remain in tact. A custom chromoly 5 point cage was welded in. On top of that, the front and rear tower bars add extra rigidity to the chassis. A twin pipe 3 row intercooler was mounted having a diameter of 100mm for each pipe. The 3 row radiator and 16 row oil cooler are also a shop original item. The water pump pulley adds support when producing big horsepower numbers. The M-SPL Falcon body kit was produced for the early model GTO with the looks of the later generation styling. The headlight assembly is turned into an air intake duct, and the windows were all replaced with acrylic units to save weight. The doors, rear hatch, and the hood are made of carbon fiber to achieve a 3300 pound vehicle.